Connecticut’s legislators are using the bipartisan budget deal struck last week to do what they could not during the regular session: Require the State Elections Enforcement Commission to dismiss complaints against candidates, including lawmakers, that are not resolved in one year. At the same time, the legislators placed a provision in the budget that more than doubles the maximum campaign contribution they can accept to qualify for public financing under the Citizens’ Election Program from $100 to $250, a change likely to ease their access to public dollars for their campaigns. The changes are non-fiscal items tucked into the budget, long a means by the General Assembly and governors to pass items that might not survive a vote on a stand-alone bill. It is a maneuver frequently used to amend elections and campaign finance laws, including an effort that nearly neutered the elections enforcement commission in 2011. 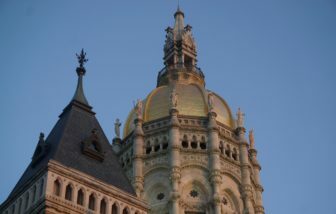 A one-year deadline for the commission’s investigations was proposed as a Senate bill during the regular 2017 session, drawing opposition in public-hearing testimony from state prosecutors and representatives of grass-roots groups such as the League of Women Voters, Common Cause, the Connecticut Citizen Action Group and the Sierra Club. No one submitted testimony in support, and it never came a vote in the Senate. But it was resurrected and included in the budget that was passed overwhelmingly last week and now sits on the desk of Gov. Dannel P. Malloy, awaiting his signature or veto. At issue is the annoyance by legislators, who enjoy the unique power of setting rules for themselves and the budget and staffing of the agency that enforces them, at what they see as the commission’s failure to reject, dismiss or otherwise quickly resolve minor or nuisance complaints. 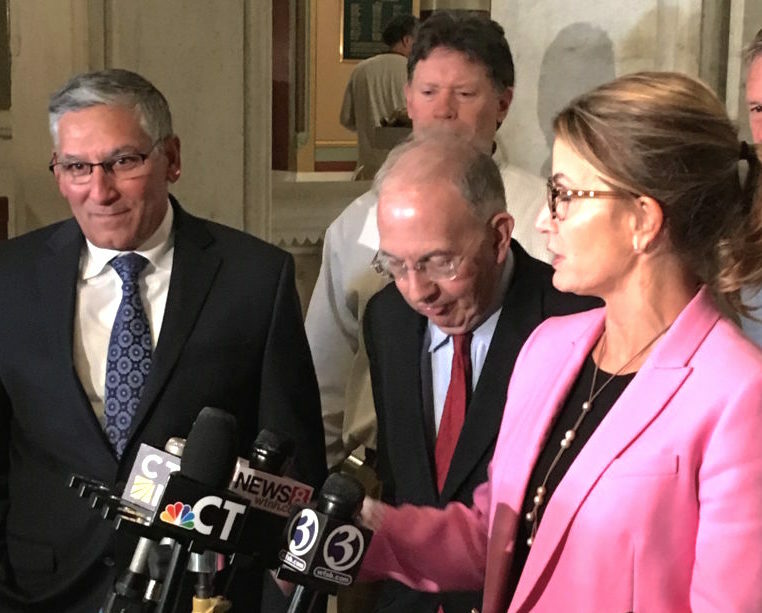 Senate Republican leader Len Fasano, left, Senate President Pro Tem Martin M. Looney and House Minority Leader Themis Klarides talk to reporters about the budget two weeks ago. Fasano said he did not seek to add the language in the budget, but he supported its inclusion, as did leaders of both parties. The new budget language says the commission’s “staff shall, at its discretion” dismiss complaints that fail to allege “a substantial violation of state election law supported by evidence” and encourages them to “speedily resolve” allegations of minor violations. More controversial is the imposition of a one-year deadline on resolving complaints, beginning with matters filed on or after Jan. 1, 2018. The deadline could be extended in limited circumstances: Time spent in litigation, enforcing a subpoena or conducting a joint criminal investigation would be added to the one year. Fasano said that is intended to provide flexibility. The imposition of a one-year limit on all investigations is an overly blunt instrument, one that will have greater impact on serious and complex complaints, said Michael J. Brandi, the executive director and general counsel of the State Elections Enforcement Commission. In complex cases, such as those involving allegations of absentee-ballot fraud, the commission’s limited investigative staff can easily take a year following leads and interviewing potential witnesses, Brandi said. At left is Michael Brandi, general counsel and executive director of the State Elections Enforcement Commission. Tom Swan, the executive director of the Connecticut Citizen Action Group, warned during the regular session that the one-year limit would offer the subjects of complaints the ability to run out the clock, especially given the staffing of the commission. “While we share some of the frustrations underlying the proposed timeline for reviewing cases, we do not believe that SEEC has, or will get, the adequate resources to meet this deadline, therefore allowing people to drag their feet to keep from being subjected to enforcement actions,” Swan said. The legislature has cut the commission’s authorized staff from 52 to 35 in recent years. Of the 35 positions, four are vacant and three are held by staffers who are union stewards, Brandi said. Under the union contract, one is working full-time on union business; two on a part-time basis. The non-partisan Office of Fiscal Analysis concluded during the regular session that meeting the one-year deadline would require adding staff, a finding ignored last week in finalizing the new budget. “We’re in a budget framework where we’re losing dollars, we’ve lost people and now the legislature wants us to go faster,” Brandi said in an interview Friday. Tension between legislators and the elections enforcement commission are longstanding. In 2011, there was an effort to effectively disband it by stripping the commission of its audit and investigative staff and giving control of public financing of campaigns to the secretary of the state’s office. Lawmakers also have moved to loosen the spending and contribution restrictions imposed on candidates who participate in the voluntary public financing program. In 2013, the Democratic majority in control at the time effectively neutered those caps with revisions allowing unlimited coordinated expenditures on legislative races by the state parties. The new provision increasing maximum contributions from $100 to $250 could ease qualifying for public financing, as a candidate could raise more money from fewer donors. To qualify, a candidate for the House must raise $5,000 in contributions of no more than $100. A Senate candidate must raise $15,000. Brandi said candidates still would have to meet a secondary requirement: Collecting 150 contributions for a House race and 300 for a Senate race. Under current law, qualifying contributions range from $5 to $100. Another change in the public-financing law would penalize candidates who qualify late in the campaign cycle. Two years ago, a Senate challenger qualified on Oct. 25, giving her a public grant of nearly $95,000 just two weeks before the election. Under the new rules, there would be a sliding scale based on how late the application for public financing was filed. An application approved 70 days before the election would be reduced by 25 percent, increasing to a 60 percent cut in the final 28 days. Correction: There are four vacancies. As originally posted, this story reported there was one vacancy, plus three others detached at times for union duties. Those three are in addition to the four vacancies.